Keep those hands healthy with our free guide! Your hands work hard, and you rely on them for a lot of things in your life, such as taking care of your family, friends, and even pets. 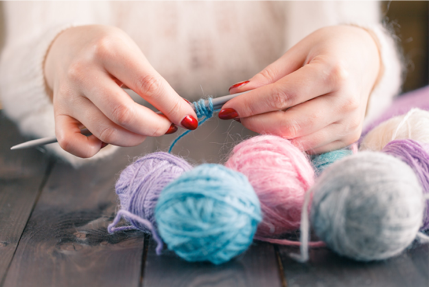 Besides everyday activities and household chores, you also need your hands for the hobbies that bring you joy: spinning, weaving, knitting, crocheting, sewing, and felting. ● Mix it up! Many crafters have more than one project going at any time, which is a great way to keep things fresh. Try to work your to­do list so that you have projects using different weights of yarn going simultaneously ­ you could alternate among a pair of socks, a worsted weight hat, and a chunky cowl, for example. This gives your hands a chance to adjust to using different size needles or hooks, so your hands don't cramp up after using nothing but laceweight yarn for weeks at a time. ● Vary your crafts! If you’ve been doing a lot of knitting, maybe it’s time to spin or felt for a while. If you’ve been weaving a large project, take a break with some knitting or crochet. ● Take a break! Sitting in one position ­ or making the same motion over and over again ­isn't healthy if you do it for too long. The last thing you need is to give yourself a repetitive stress injury during a marathon knitting or crocheting session! When you're working on your craft, pause every 15 or 20 minutes and do something different to give your body a rest. Do a stretch or two, walk around, get a glass of water, or throw in a load of laundry ­- anything that gets you moving in a different way will help you stay comfortable when you return to your craft. ● Be realistic! Allot yourself more time than you think you will need to complete your projects. Crafting on a deadline turns fun into work and creates situations where you are tempted to push past your body’s limits in order to get things done. That’s a recipe for injury. We've already delivered the full Healthy Hands for Happy Crafting guide to our newsletter subscribers, so check your inbox or click here to sign up & receive a PDF download today!